Yang Jian (541-604) - After more than two centuries of division (since the early days of the Jin Dynasty), China was finally, once again, united. That feat was accomplished by Yang Jian. 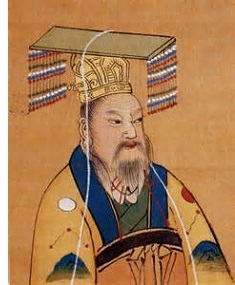 Also known as Emperor Wen of Sui, he was founder and first emperor of the short-lived Sui Dynasty. Like Emperor Wu of Liang, he was also a Buddhist (see Xiāo Yan), which is an indication of the growing influence Buddhism was having in China. Moreso, he was an advocate of spreading Buddhism throughout his kingdom. Before reunifying the state, he rose to power as a leader of the Northern Zhou Dynasty, one of many kingdoms in a divided China. However, he was not in line of succession. He was the father-in-law and defense minister of Emperor Xuan, and usurped the throne upon Xuan's death in 580. It took him about a year to consolidate power, but when he did, he founded the Sui Dynasty in 581. Over the next eight years he would bring all of China under his rule. History remembers him as one of China's more significant emperors, and his reign is considered the most prosperous since the end of the Han Dynasty. This wealth allowed him to engage in several building projects. For starters, he built a new capital named Daxing, which was not far from the old capital of Chang'an (in fact, the two eventually merged into one city). It would remain China's capital for the next three centuries. But by far the greatest building project under his reign was the construction of the Grand Canal (see below). In truth, the two projects were actually related. Emperor Wen needed a more efficient way to supply his new capital with food, and the Wei River, which had been used, was considered too unreliable. The canal was not completed during his reign, which ended in 604, but shortly thereafter.